After a lingering Everything Must Go, the shutters are down at Tip Top Gift, the martial arts & sundries store that held down a spot next to Smith's for thirty-five years. It's another piece of the Fifth I got to know when I first moved to Brooklyn, thirty years ago. The era of those 1980's tax photos! 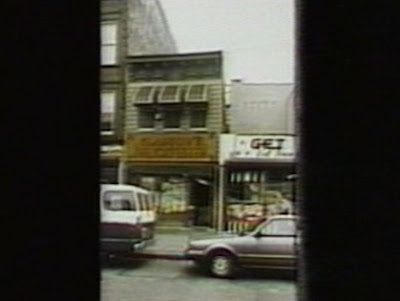 Fifth to me back then meant bargain stores & cheap boutiques, bakeries with cozy cafe con leche counters & brightly decorated cake-filled windows. It meant Glasgow's, Timboo's & the OTB. O'Neil's, Classico Man, Capri Fashions & Queen-in-Bazaar. Farther down the avenue, others - Stavenhagen pawnshop, Eagle Provisions, & Morisi's pasta. Too many more to remember. Whenever I walk on Fifth in Sunset Park, I get flashbacks to my piece of the avenue back in the 80's. I miss it. We all look back to the city we knew when we were younger, the city we arrived in. I live with a New Yorker who trumps my 80's Manhattan & Brooklyn with apocryphal tales of a 70's East Village, checker-cab driving adventures, concerts at the Fillmore East, and a Soho dark & desolate at night. I wish I had that New York decade tucked in my mind. And of course, I envy those whose city memories go far, far farther back in time. Oh, to have seen the city then. So sad to hear that Tip Top closed. We remember photographing it the day we also captured Fifth Avenue Record Shop. Yes, it's a shame. That block has (had) a good concentration of older businesses, what with Square Stores, Smith's, the diner, the Record & Tape Center, & the liquor store. I wonder what will ever happen to Garry's - I used to run into Michael, but haven't seen him for a while. He had dreams of re-opening, but I can't see that happening. Nice that Neergaard's - my go-to-pharmacy - is still going strong. Did you ever photograph Catene's when it was around? I see one of the former owners every so often - lovely guy. He gave me a great deli recommendation!